Mike is Geography Cat’s official stunt double. It’s not that Geography Cat is afraid of heights, but he doesn’t much care for car journeys, I’m sure you understand. The amazing thing about Cheddar Gorge is that it was formed in the regular way that gorges are formed (see Geography Cat’s article on this for more detail) and yet the rock is limestone. This is remarkable because limestone is a permeable rock, therefore you wouldn’t expect a surface river to flow across it, instead you would expect the surface water to permeate into the limestone and flow as ground water. However, at the time that Cheddar Gorge was formed the climate here was very different, in fact it was formed during periglacial periods over the past 1.2 million years. The climate in this place, at that time, would have been similar to the Arctic climate today. Therefore the limestone, the soil, the mud and the groundwater would have all been frozen solid, making the rock impermeable, meaning that water could not seep into it. At the same time as the limestone was impermeable due to permafrost, there were massive outflows of melting glacier water, making a fast flowing powerful river right here. As the river cut its way across the frozen limestone rock it passed a slighter softer layer and eroded that more quickly, resulting in a waterfall which retreated backwards upstream every time its overhanging cap rock collapsed. This aerial photograph is from the Britsh Geological Survey and shows the course of the ancient meltwater river. The map below shows the geology of the Cheddar Gorge area (it is also from the British Geological Survey). A geological map like this can be confusing at first, so compare it with the aerial photo above. Find Black Rock Gate and then follow the shape of the gorge. 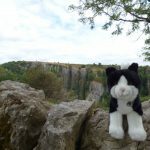 As Geography Cat is not a high level geologist he doesn’t fully understand the differences between the many types of limestone shown here. He can tell you, though, that oolite is yet another type of limestone. Now that the climate has warmed up the limestone and surface layers of soil and mud have thawed and the water no longer flows on the surface but permeates the limestone and makes underground drainage. The results of the flowing groundwater can be seen in the caves at Cheddar Gorge. Meanwhile the gorge itself is now dry. In this photograph of rocks on the footpath, you can see that they have been smoothed and polished by the foot prints of the many thousands of people who have walked this trail. The footpath up, around, down, up, around and down again is clearly signposted by the National Trust, although Mike feels it fair to warm you that this is not a walk to be undertaken in flipflops (as he saw some people doing), it’s definitely a walking boot route. The National Trust say that the route is around 1 hour 40 minutes in duration, but Mike completed it in just under 3 hours with lots of little breaks to either take a photo, or get his breath back (you decide! ).